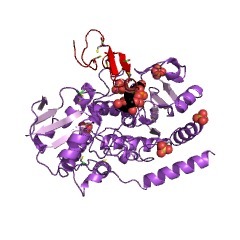 The CAP10 domain is found in glycosyltransferases found in animals, plants and fungi. 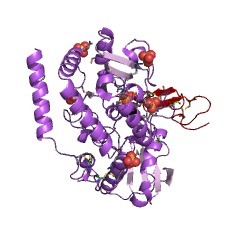 In animals, glucosyltransferases catalyze the transfer of glucose and/or xylose from UDP-glucose and UDP-xylose, respectively, to a serine within the consensus Cys-Xaa-Ser-Xaa-Pro-Cys) in epidermal growth factor repeats, such as those found in coagulation factors F7, F9 and NOTCH proteins. Notch signaling is regulated by Notch glucosylation and glucosylation is required for the correct folding and cleavage of Notch [(PUBMED:18243100), (PUBMED:21490058)]. The pathogenic fungus Cryptococcus neoformans, which most commonly affects the central nervous system and causes fatal meningoencephalitis primarily in patients with AIDS, produces a thick extracellular polysaccharide capsule which is well recognised as a virulence factor. The CAP10 domain is required for capsule formation and virulence [(PUBMED:10482503)]. 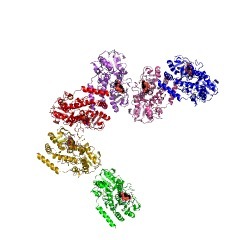 The capsule is primarily made of two xylose-containing polysaccharides, glucuronoxylomannan and galactoxylomannan, and the glycosyltransferase transfers xylose to alpha-1,3-dimannoside in a beta-1,2-linkage [(PUBMED:17430900)]. There are 5522 CAP10 domains in 5510 proteins in SMART's nrdb database. Taxonomic distribution of proteins containing CAP10 domain. This tree includes only several representative species. 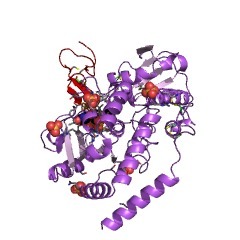 The complete taxonomic breakdown of all proteins with CAP10 domain is also avaliable. Click on the protein counts, or double click on taxonomic names to display all proteins containing CAP10 domain in the selected taxonomic class. Isolation, characterization, and localization of a capsule-associatedgene, CAP10, of Cryptococcus neoformans. Cryptococcus neoformans is a pathogenic fungus which most commonly affectsthe central nervous system and causes fatal meningoencephalitis primarilyin patients with AIDS. This fungus produces a thick extracellularpolysaccharide capsule which is well recognized as a virulence factor.Here, we describe the isolation and characterization of a novel gene,CAP10, which is required for capsule formation. Complementation of theacapsular cap10 mutant produced an encapsulated strain and the deletion ofCAP10 from a wild strain resulted in an acapsular phenotype. The molecularmass of the hemagglutinin epitope-tagged Cap10p is about 73 kDa, which issimilar to the size predicted from sequence analysis. When CAP10 was fusedwith a hybrid green fluorescent protein construct, the fluorescencesignals appeared as patches in the cytoplasm. Using a reporter geneconstruct, we found that CAP10 was expressed at high levels inlate-stationary-phase cells. In addition, we found that the expressionlevels of CAP10 are modulated by the transcriptional factor STE12alpha.Deletion of STE12alpha downregulated the expression levels of CAP10 whileoverexpression of STE12alpha upregulated the expression levels of CAP10.Animal model studies indicate that deletion of the CAP10 gene results inthe loss of virulence, and complementation of the acapsular phenotype ofcap10 restores virulence. Thus, CAP10 is required for capsule formationand virulence.